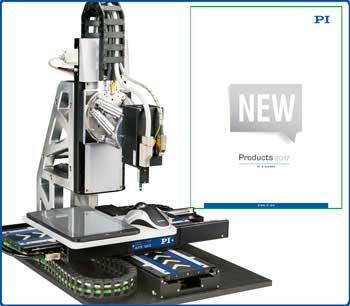 (Nanowerk News) Motion and precision positioning systems expert PI (Physik Instrumente) issued a catalog on newly introduced precision motion solutions for photonics, robotics, microscopy, and highly accurate industrial automation applications at LASER World of PHOTONICS, held in Munich, Germany last month. The 80 page catalog covers products and custom engineered systems, including automated photonics alignment engines, linear motor stages, piezo actuators, air bearings, hexapod Stewart platforms, and high performance motion controllers. Creative application solutions complement the existing comprehensive portfolio of precision motion and positioning technologies, components, and systems. As the leading international conference and trade show for photonics, lasers, and precision optics since 1973, LASER engaged and educated more than 32,000 visitors. PI’s interactive product displays included laser micro-machining setups, 10-axis touch panel test systems, high-speed gantries, SiP alignment systems, high-speed direct drive stages, and parallel-kinematic machines.